Information security should be focused on "moving from the 'T' in IT, to the 'I' in IT' according to panel moderator Martin Kuppinger from KuppingerCole Analysts. Information security has often been focused on technical related controls, with point solutions based on software and hardware being deployed, in the hope that a 'silver' bullet style cure is found for all attacks, breaches and internal issues. This is an unsustainable model, from both a cost and effort perspective, but what areas provide a good return on security investment? 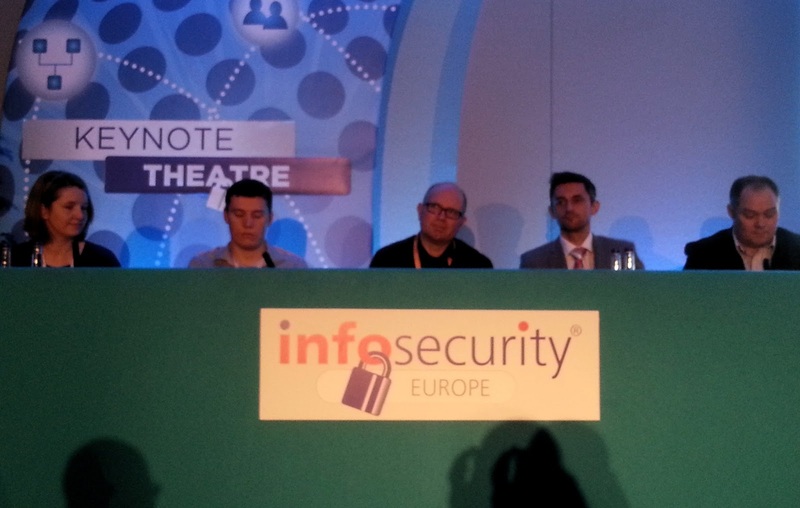 An expert panel in the keynote theatre at day 3 of Infosecurity Europe, aimed to find out. Michelle Tolmay, from retailer ASOS, commented that the people, in the people, process and technology triad, is increasingly more important that simply installing and configuring technology. Dragan Pendic, from drinks manufacturer Diageo, also described how building the information security business case, requires focus on the 'right people' within the organisation. As budgets are finite, all spending needs to be fully justified and explained in business language to key business stakeholders. Dragan articulated, that whilst the majority of the security budget is ring fenced for legal and regulatory compliance, any remaining funds are spent wisely, focused on identifying security stakeholders with the correct role and responsibilities in order to the make existing and new security technology work smarter. Graham McKay, of DC Thomson, described, that whilst risk should be decided by the business, countermeasures should be implemented by the IT and security teams, with a key focus on sustainable education. He argued point solutions are nearly always breachable at some point in time, and that employee training and awareness is a much more effective and sustainable way to protect information. Cal Judge from Oxfam explained that for training to be effective, it needs to take a personable and story based approach, trying strongly to avoid the dry, theoretical policy lead content. Michelle also added, that by making examples of the security implications employees face in real life, helps to articulate what measures need to be implementated in the work place. In any organisation, there is a clear trade off between business effectiveness and security implementation. Graham described that an organisation will never be 100% secure, as commerciality will always take hold. Whilst technology obviously has a major role to play, learning the full technical limitations, integration steps and implementation paths are key to fully maximising a return on investment commented Pendic. Often technology is not implemented to the maximum of it's capability, resulting in cheaper alternatives being overlooked or not evaluated. Cal Judge promoted the use of vulnerability scanning of existing technology as an effective spend, arguing that this can help to simulate what an external attacker would look for, from an internal and external asset perspective. Michelle Tolmay added that overly restrictive policies are actually counterproductive and costly, resulting in employees taking shortcuts and workarounds that will ultimately put the business at risk. She also commented that relationships are the underlying success factor for effective infosec spending. Relationships between internal employees across departments and external relationships between the organisation, audit teams and external regulators all play a key part in understanding how to fuel infosec project spending.